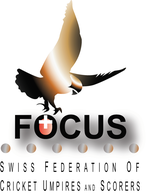 The Swiss Federation Of Cricket Umpires & Scorers have announced that there will be an swissFOCUS Introduction to Umpiring Course to be held at the Centre sportif des Vernets in Geneva on Saturday 19th April 2014. The course costs CHF50 per participant, which includes course handouts and the examination, and 2014 membership of swissFOCUS with all the benfits that come with it. Participation is limited to 20 participants and will taken on a first-come, first-serve basis. Further information is available from Alex Mackay or Paul Cawsey.